This isn’t easy you know, these pics don’t come out of thin air. Not that I have many complaints, it is an exciting hobby looking for pics that I feel are new to the spanking community. I know that not everyone likes the fact that I claim to discover these pics but I don’t know what else to do, virtually every pic that I share I have spent hours searching through vanilla archives to find. Tell you what, go to Archive.org, put in the search term ‘Yearbooks’ and start to go through the twenty two thousand books they have. I’m Telling you, it isn’t an easy thing at all. It is with great irony actually that something that I was taken to task for last year is prompting me to share this great Damsels In Distress spanking picture today. The irony being that someone was very vocal in their opposition to one of my practices last year, yet this week they did exactly what they were vocal against me doing. The irony made me incredibly happy and made me want to share something special with you all. 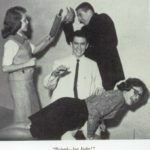 So this weeks spanking pic comes from 1959 and is from the play “Damsels In Distress”. This particular play I only have 4 pics from and 3 of them I have shared already. Actually, I do have a couple more but they were ones that were shared with me so I can’t rightly say that I found them. 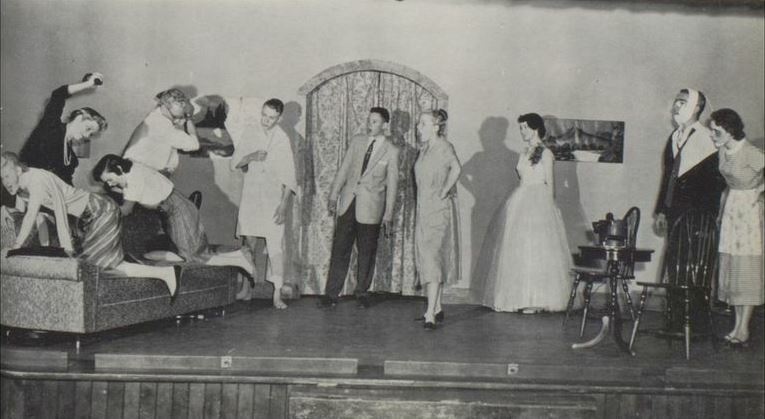 Among my many folders I have one titled VARIOUS SCHOOL PLAYS which is where the other two Damsels In Distress spanking pics are located. This pic will also be added to that folder. I think you and I are probably the only two spanking site owners who actually spend much time going through vanilla sources to find the occasional spanking item (photos for you, comic-book and independent art featuring comic-book and strip characters for me). The downside is how hard it is; the advantage is that when we find something it will almost surely be unknown to our fellow spankos. Damsels in Distress is not a play I’d ever heard of. Perhaps I’ll research it thoroughly one day, but for now, what you have is a historical find. The girls in the play are having big spanks,best Tim.